Choose here the generator controller suitable for your applications. A brief presentation is provided for each item. Each controller is very well presented in separate pages. On-line purchase together with download documentation & software is available as well. Wide choice of AUTOMATIC MAINS FAILURE and AUTOMATIC TRANSFER SWITCH control panels for commercial and industrial applications in the range 15 up to 160kVA. ON-LINE purchase options for small sizes. Using the Bernini Design genset controllers you can expand the visibility of you power system performance to your customers – whether in the facility or off-site – through a on-site server (via the intranet or Internet), via GSM or via RS485 cable. Bernini Design remote monitoring equipment provides a cost effective and efficient means of remotely monitoring and controlling generator sets, automatic transfer panels and miscellaneous devices. You can access the remote monitoring equipment from any computer or mobile phone. LESSONS OF FULL IMMERSION IN THE AUTOMATIC MAINS FAILURE CONTROL PANEL MATTER. You may wish to know, - what are Generator Controllers or, (without using such industry contractions) 'Generator Control Systems' and what do they do? Taken as a units, they encompasses intelligent electronic controllers, of any form, that integrate 3-Phase Mains Failure Control Modules, Circuit Breaker Controllers, Alternator Monitoring Modules, Engine Control & Monitoring Modules and a Serial Data Interfaces. Generator control systems must provide clear visual indication by means of LEDs and Displays for all supervised parameters and alarms. A chosen Bernini Design Genset Controller features a range of programmable settings (from a minimum of 10 up to several hundreds) and is engineered to comply with international standards recommendations. Some of our genset controllers feature RS485 and CANBUS in order to communicate with engines equipped with ECUs (Electronic Control Unit according to the SAE-1939 standard). 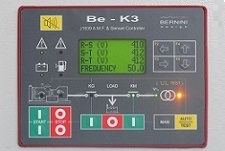 Complex genset controllers may include all modules indicated above (example BeK3, Be2K-Plus). 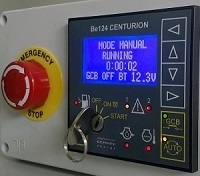 Simple genset controllers may include some of them (Be142, Be1,Be24....) or simply only one of them (Be72). This affects the total size and weight of the Genset controllers. The Bernini Design Genset Controllers operate reliably in a range of environments, from minus 30 up to 70 degree Celsius. In some situations LCD displays (Liquid Crystal Display) are not recommended at the extremes of this range. As a matter of fact it is quite difficult to obtain good readings below 15 degrees Celsius on an LCD Display. The majority of the applications for Generator Controllers find a convenient mounting place directly on the frame of a Diesel Generator. In this case the genset controller must be both rugged and vibration proof (all Bernini Design Genset Controllers satisfy this requirement). In some case the genset controllers are connected with a separation as much as several hundreds meters from the Genset itself. This is not an issue of concern since that all Bernini Design generator control systems feature a rugged RS485 serial interface, allowing you to drive a twisted cable length as distant as 1000 metres. First of all: what an AMF Controller is. 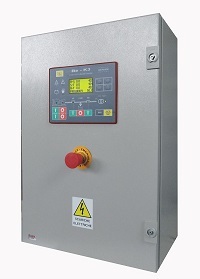 An AMF (Automatic Mains Failure) controller is the ideal choice in cases where you have to control a Genset that is connected to the Mains in a standby configuration. In other words a system that is normally waiting for a failure of the Mains Power. 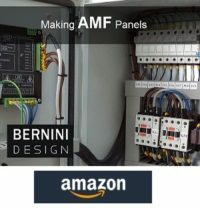 A panel fitted with AMF controller manages, in a fully automatic way, the connection assignment of the LOAD to MAINS or GENERATOR. The panel includes an automatic battery charger and a set of electronic circuit boards complete with power relays that interface directly with the engine. The AMF controller is conveniently tasked with driving the Power Circuit breakers or Switch-gear. Despite the fact that the power configuration and general arrangement is the same for all panels, the input output lines for the engine connection and ancillary equipment depends on the type of controller fitted into the panel. Ancillary devices are normally provided, example: RS485 serial interface, remote control, monitoring systems, Modems, Internet connection and so on. The available sizes on the market are normally in the range 10-1000kVA. A normal house or big villa needs as much as 9kVA of power. So in other words we can say that an AMF controller is a form of 'specialized genset controller' more suited for Automatic Mains Failure Panels.